I love these brave men and women who are putting their lives on the line serving US in the U.S. Military. The other day at the airport I saw a group of soldiers returning from Iraq in their fatigues. I dropped my bags, stepped up and saluted them. I thanked them for serving our country! Now you will understand. I hope their families see this blog so they can know how much we all appreciate the sacrifice they are making, and how much we love their husbands, fathers, and sons! Mr. Ray Thank you so very much for your kind email to me and my father. I’ve watched your “Footprints of God” series several times in the past few months with various members of our US Armed Forces stationed in Baghdad, Iraq. The “Footprints of God” series you produced is excellent, both in content and in style. The music, the scenery, your explanations, your willingness to get wet, dirty, hold snakes and goats, go to remote locations and maintain such enthusiasm is palpable. I’ve learned a tremendous amount of information about the most important thing in this world–the life and times of Our Lord, Our Lady, the prophets who pointed the way to Our Lord and Our Lady, and the early Church Fathers who followed Our Lord and Our Lady to their graves. STEVE RAY HERE: I SALUTE YOU! I THANK YOU! 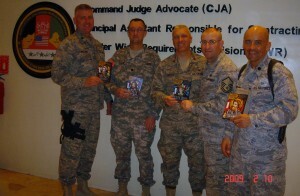 I AM OVERJOYED THAT MY HUMBLE EFFORTS WITH “FOOTPRINTS OF GOD’ HAVE BLESSED YOU MARVELOUS MEN & WOMEN IN THE US MILITARY! MAY OUR LORD AND LADY SMILE DOWN UPON YOU — AH, I KNOW THEY DO THAT ALREADY! Since October 2006 I have been in Iraq almost 27 months. During that time I have been graced to help bring many people into the Catholic Faith. Much of my preparation consisted of Steve Ray’s “Footprints of God” series. I’ve shown them countless times to individuals and small groups, but also in my RCIA classes I have conducted. Steve has been very supportive of me giving me great words of encouragement and I regard him a “Brother” in the Lord!!! We are on the winning team!!! Next post: Steve’s New Brochure; Look OK?